Basketball nearly died in Boston. And a Lakers fan from Inglewood saved its life. Pierce’s legacy was forged over the course of 19 tumultuous years, 15 of which he played in Boston. He did not receive a king’s welcome when he arrived. He was not anointed the savior of the franchise. Celtics fans made their opinions loud and clear: Pierce is good, but he will never fill Larry Bird’s shoes. Ironically, Pierce spent his youth rooting against Bird and the Celtics as a fan of Magic Johnson and Showtime. Little did he know that he would spend his career trying to recreate that level of excellence those legendary eighties Celtics teams had once established. Faced with unfair comparisons, annual trade rumors, and even a near-death experience in 2000 when he was stabbed 11 times outside of a Boston nightclub, Pierce battled endless adversity. But through these tribulations, he developed as a player and a person. He recovered from the nightclub assault and played in all 82 games that season, demonstrating true grit and resolve. 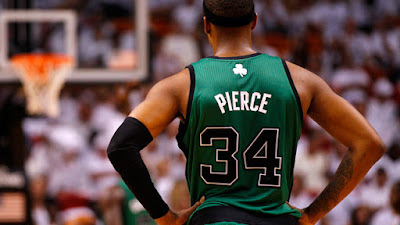 As Pierce matured to become the Celtics’ top player and eventually team Captain, his courage and determination was increasingly evident. Perhaps it was the pressure of carrying the NBA’s most historic team on his shoulders for nearly two decades that helped him transform from stone to diamond. From selfish to leader. From talent to greatness. From doubt to Truth. The Celtics were a mediocre team in the nineties. The tragic and untimely death of Len Bias and Bird’s early retirement left them without a capable successor and the team quietly descended into irrelevance. It was Pierce who led the charge in restoring the Celtics to prominence all while establishing himself as one of the most underrated All-Stars the league had ever seen. When he brought home Banner 17, Pierce finally succeeded in capturing Boston's heart while exhibiting unconditional love and respect for a city that took too long to embrace him back. Pierce was there for it all. He was there for the Antoine-Wiggle and for Ricky Davis. He won a championship with Ray Allen and Kevin Garnett, but also played his heart out alongside Allan Ray and Kevinn Pinkney for the last-place Celtics just one year prior. He even came within a Kendrick Perkins injury of winning a second championship in 2010. And through these experiences, Pierce became the beloved face of the NBA’s most decorated franchise. Growing up, I loved listening to my father's descriptions of great moments in Boston sports history. From “Havlicek stole the ball,” to Bobby Orr’s flying goal celebration, to Carlton Fisk waving his World Series home run into the left field foul pole. Throughout these stories, one thing was always crystal clear: Boston is an amazing sports city where anything is possible. And thanks to Pierce, an entire generation of Celtics fans has uniquely emotional sports memories to pass down to their children. From the wheelchair game, to countless game-winning shots and unforgettable championship bouts against Kobe Bryant that revitalized one of the greatest rivalries in sports, Pierce proved to be the greatest clutch scorer Boston had ever seen. Older fans will assure you that his accomplishments earned him a spot amongst the other Celtics heroes both in their minds and in the Garden rafters. But for the fans who grew up with Pierce, his accomplishments will be forever celebrated when we tell our own kids that his raising of the championship MVP trophy as he screamed in exaltation was our proudest moment as Celtics fans. After today, we will always look up and pay our respects to that #34 in the rafters. And someday we will tell our children just how lucky we were to see him play. Legends are far from perfect. They have scars and blemishes. They make mistakes. They fall down, but more importantly they get back up. And when faced with their greatest fears, they find strength in the fires of adversity. If a kid from Inglewood can grow up to become the heart and soul of the Boston Celtics, then we can all learn to be a little bit better.